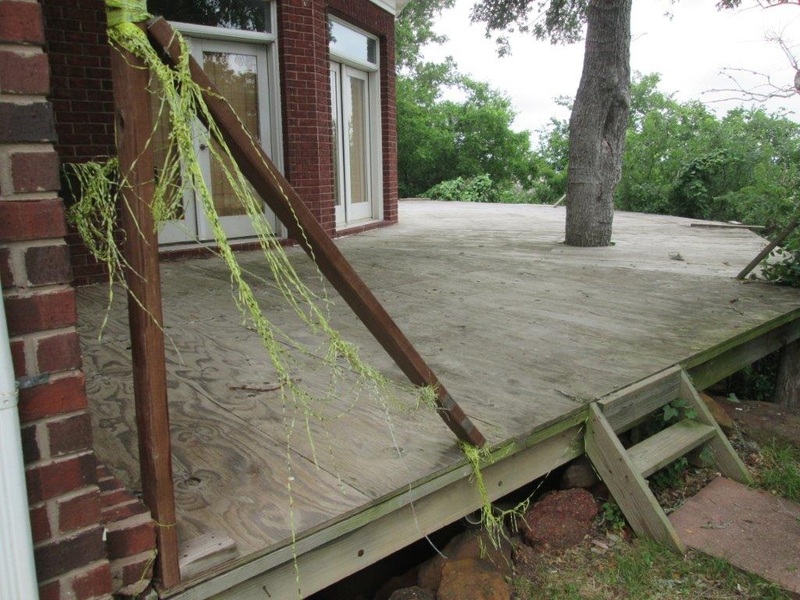 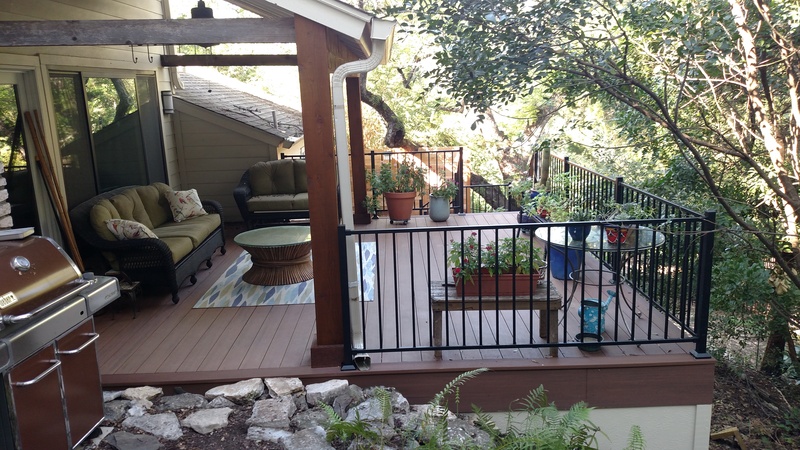 Archadeck of Austin Transformed an Existing Concrete Patio into a Lavish Outdoor Oasis! 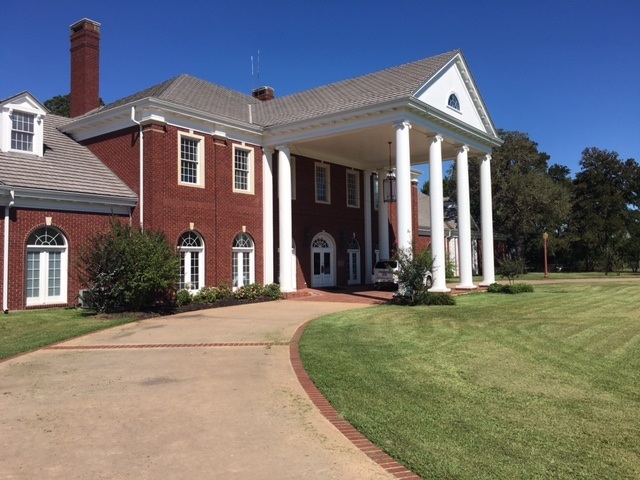 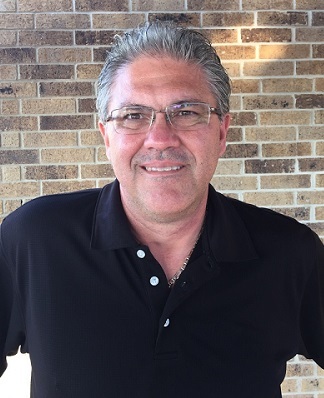 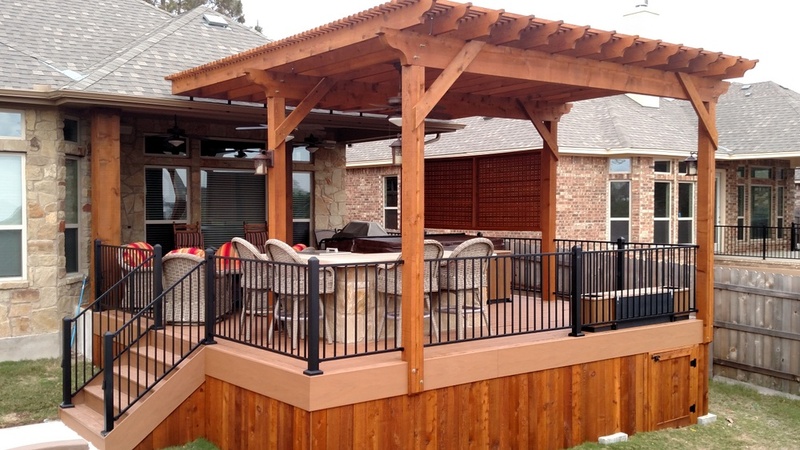 Our line of business not only entails providing high-quality designs and workmanship on each of our outdoor living structure additions and renovations, it also involves helping our customers “imagine” what their outdoor can be and making that vision come to life. 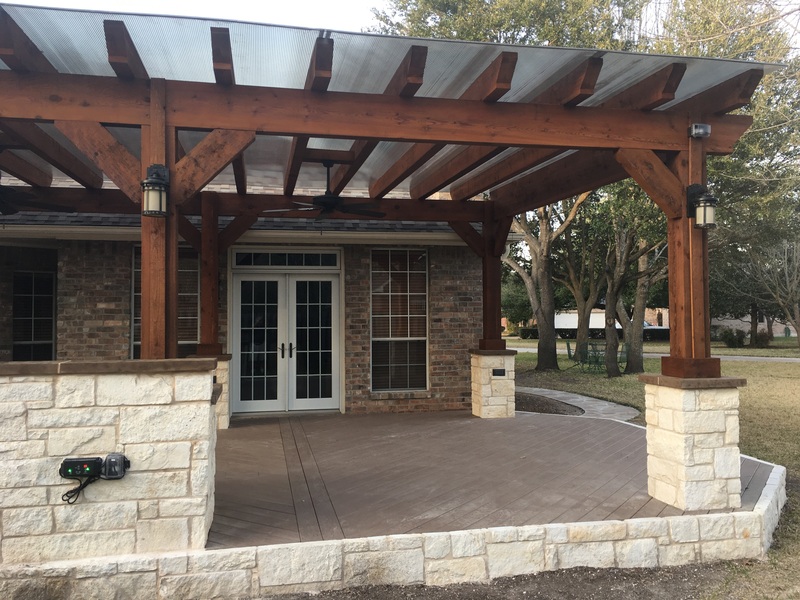 This is where the expertise of a seasoned, experienced design and build team comes into play — making the unimaginable, a reality. 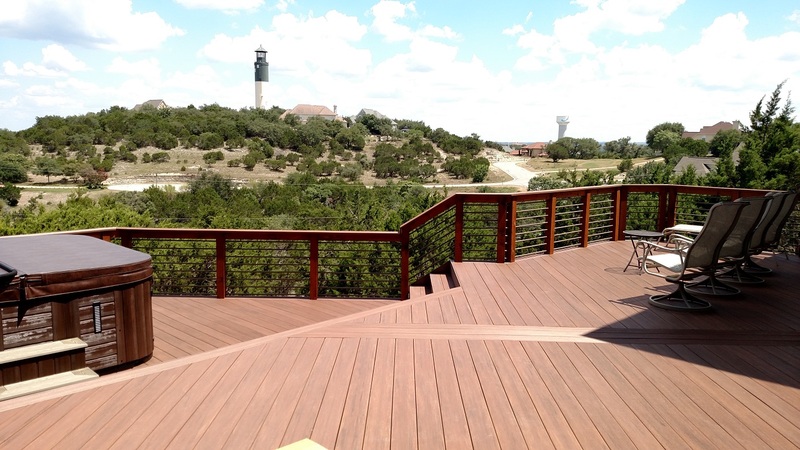 “Realizing the vision” is exactly what we did in one of our recent projects in South Austin, TX. 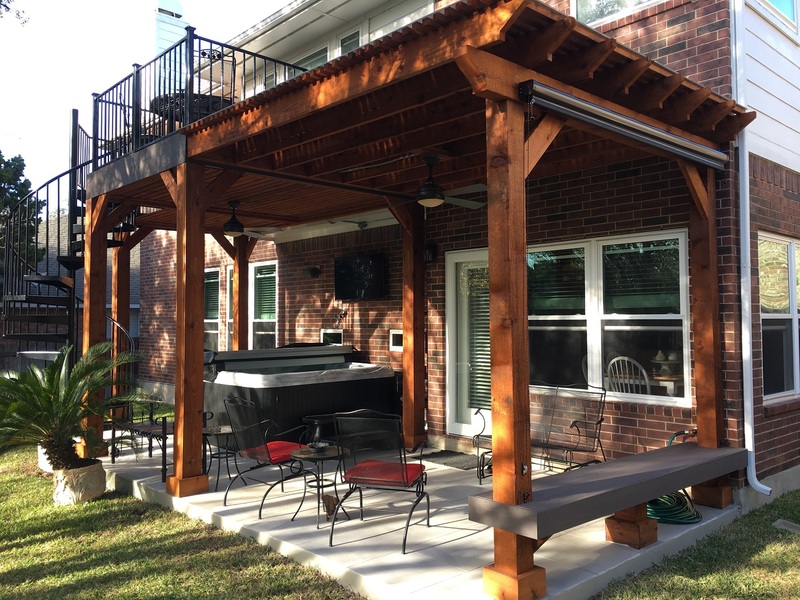 We used an existing concrete patio as the base for a multi-functional outdoor oasis that includes a spacious deck with pergola, stone bar entertaining area and private spa area. 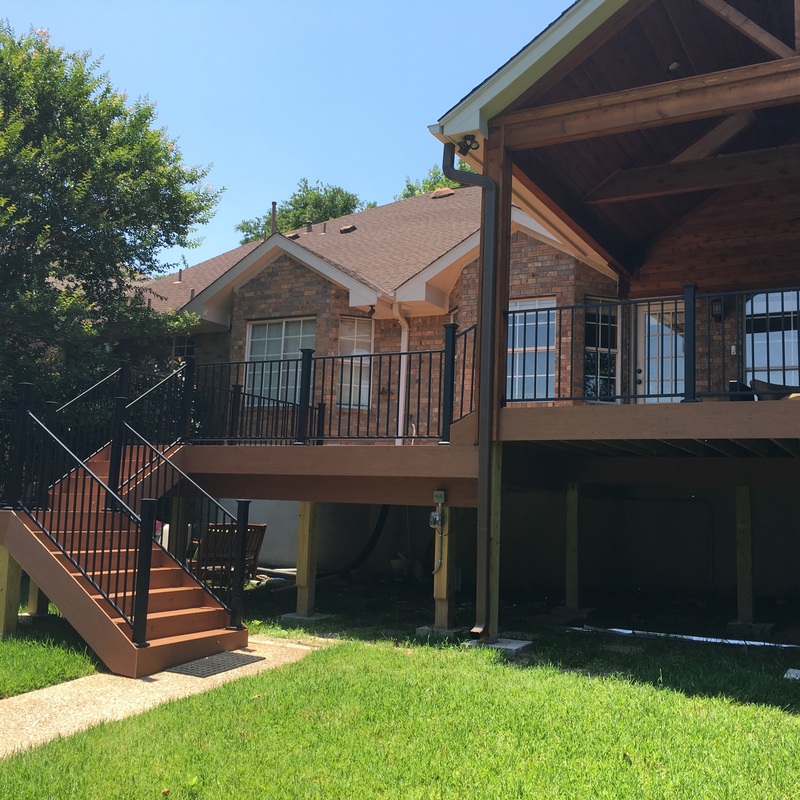 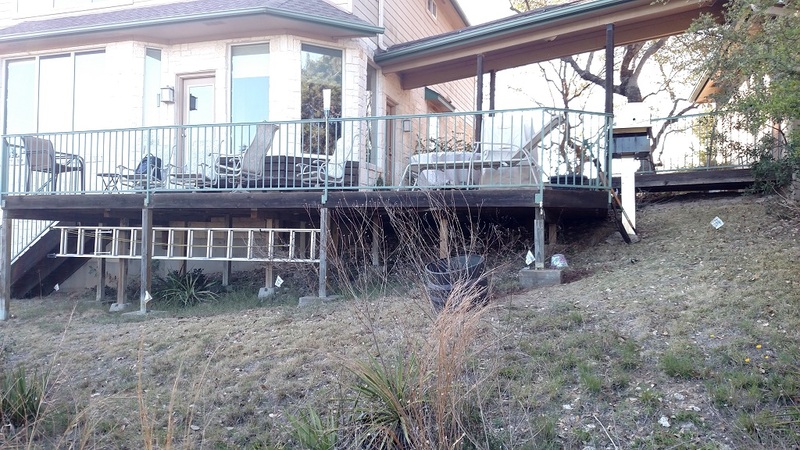 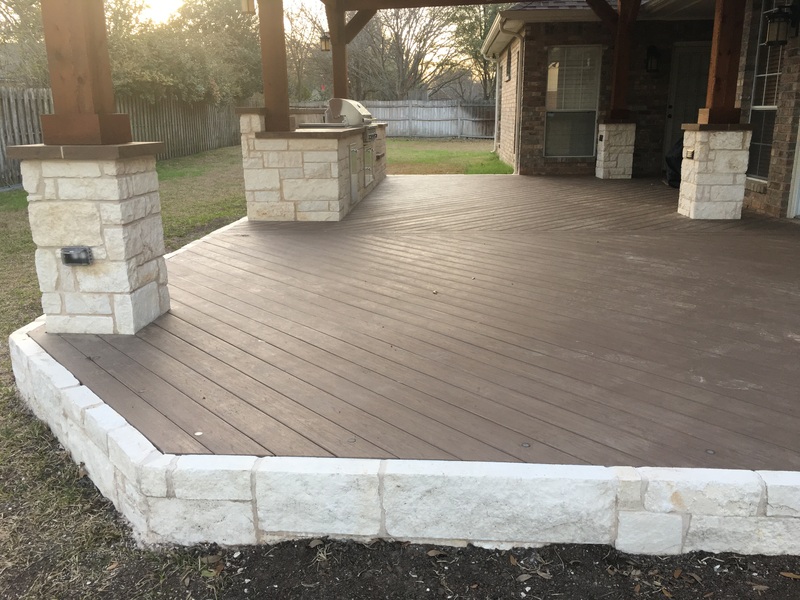 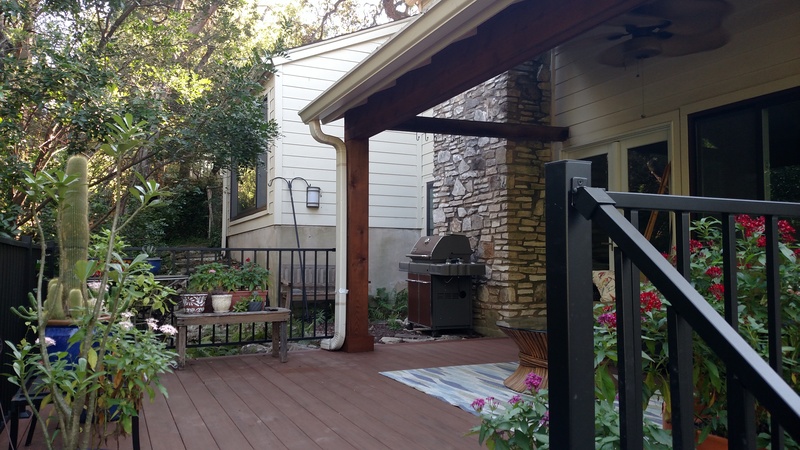 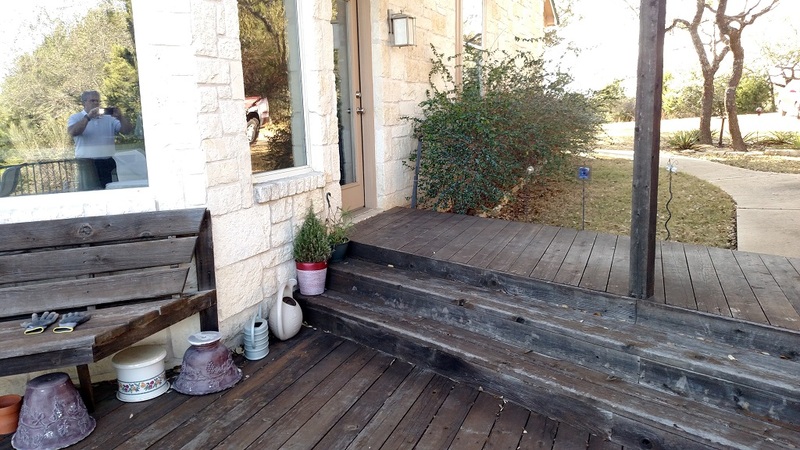 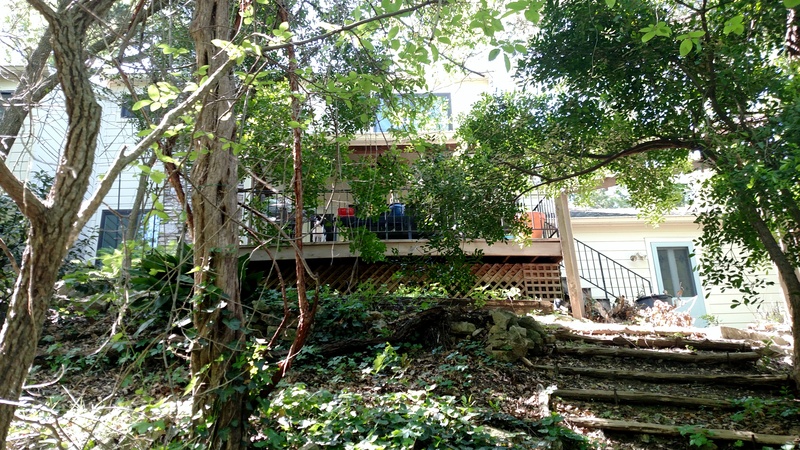 We began the backyard transformation by staining the existing concrete patio and building a low-maintenance AZEK deck just off the patio that extends off the rear of this South Austin home. 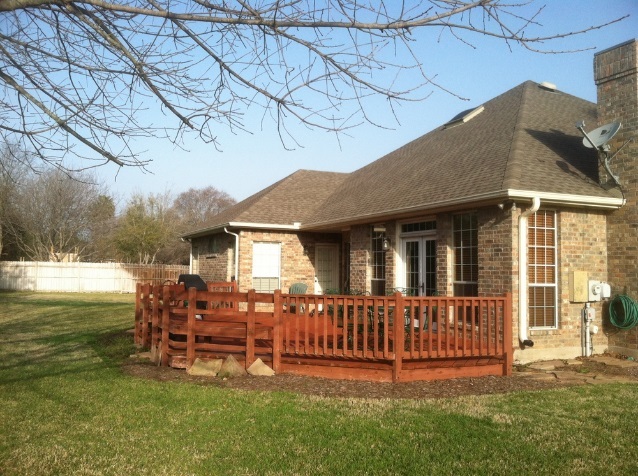 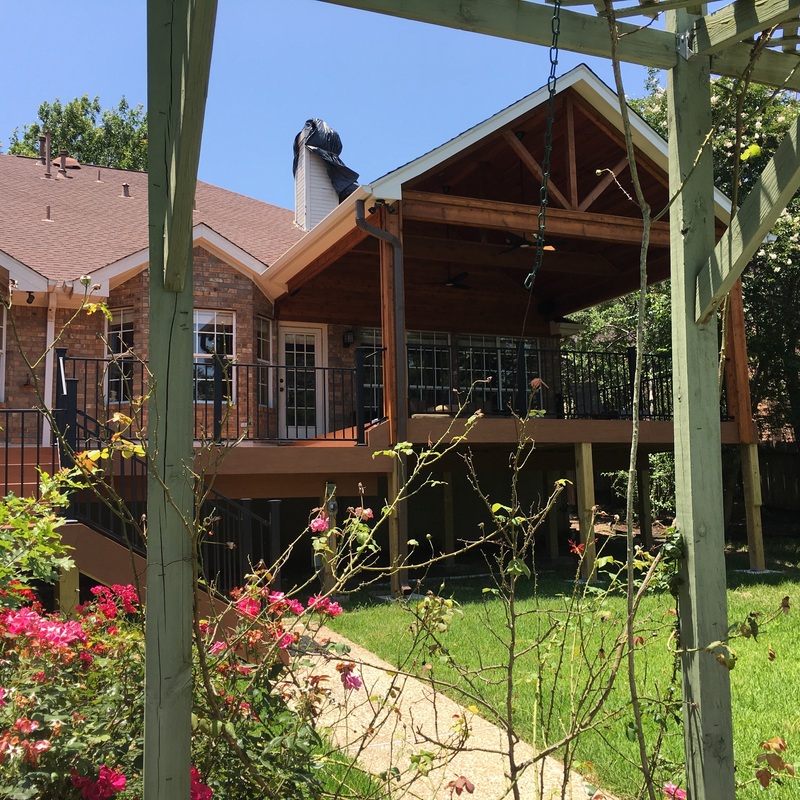 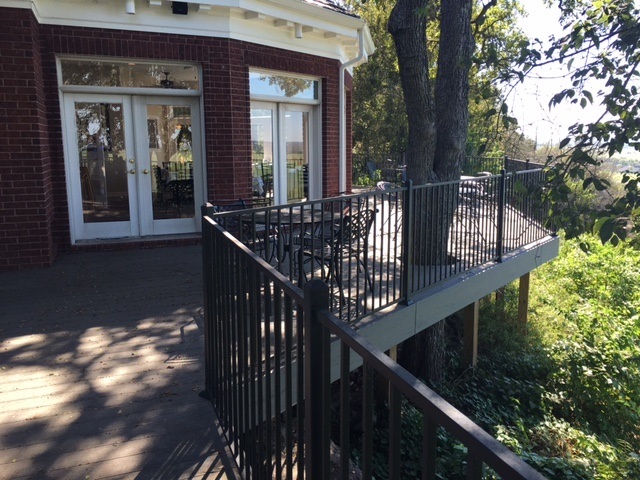 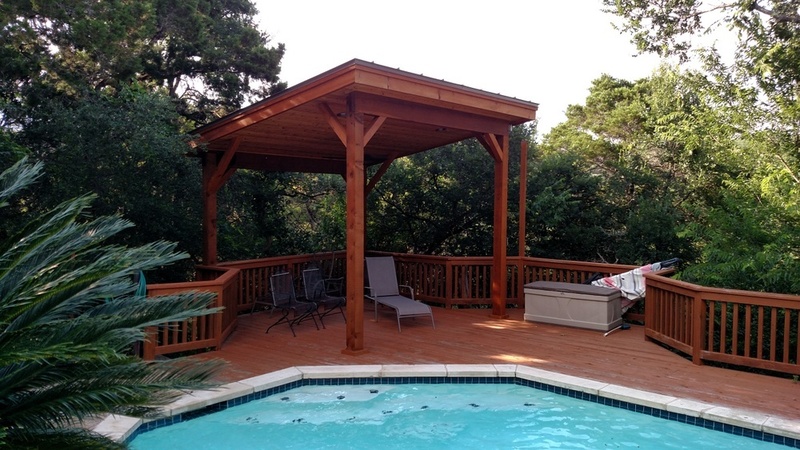 The deck is quite spacious at 20′ deep and features a 20 x 20 overhead cedar pergola that anchors the space. 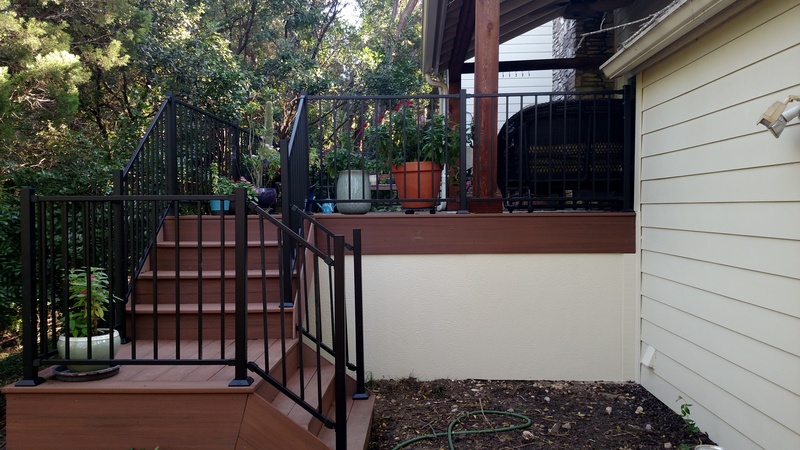 The color the homeowner’s chose is Harvest Bronze. 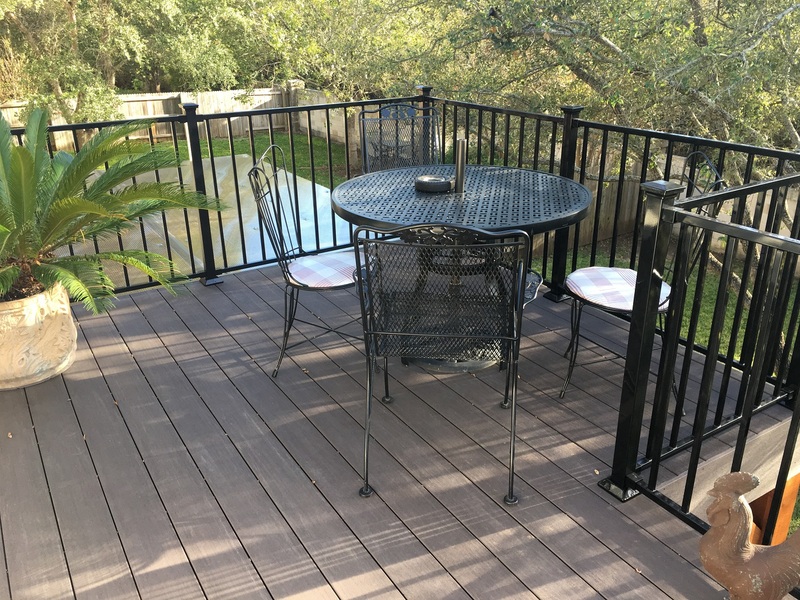 Fortress Sand Black rail. 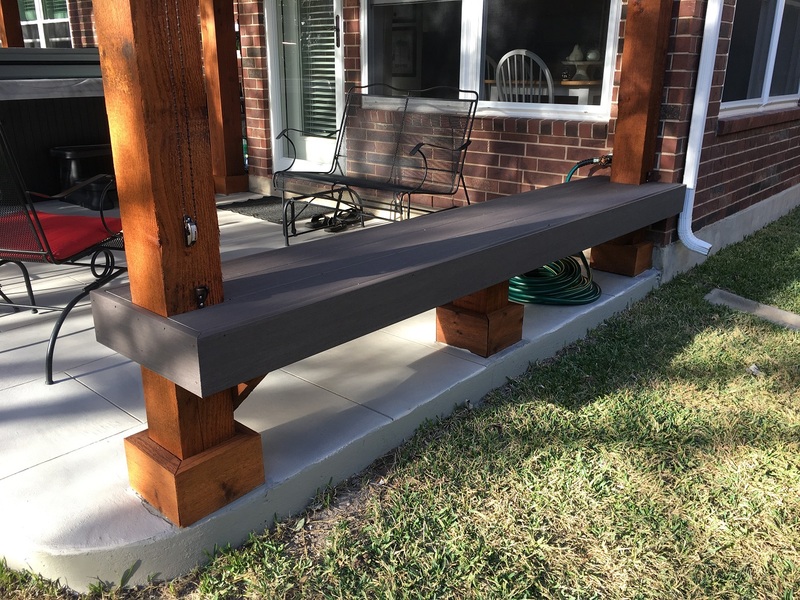 The sand finish is cooler to the touch and is a matte finish vs. a high gloss finish fitting with the rustic details present in the space. 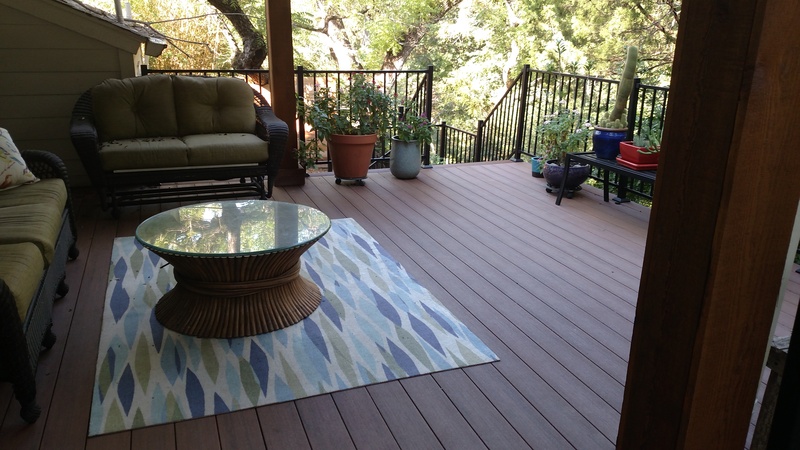 We also finished off the deck with a full privacy cedar skirt with a door for access to the under side. 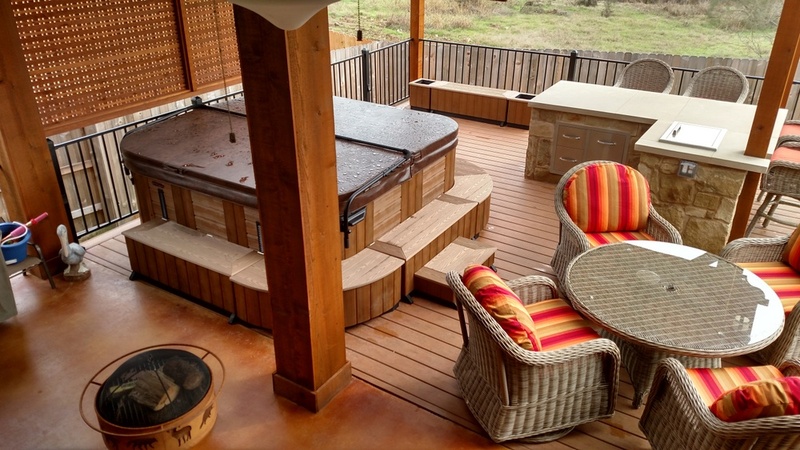 Archadeck of Austin also brought in electrical service to all the fans and hot tub. 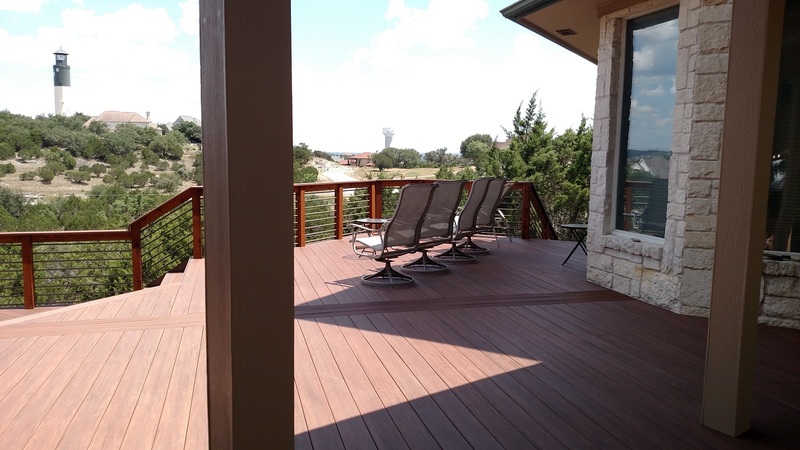 The deck also includes a tranquil spa for the homeowner’s to enjoy. 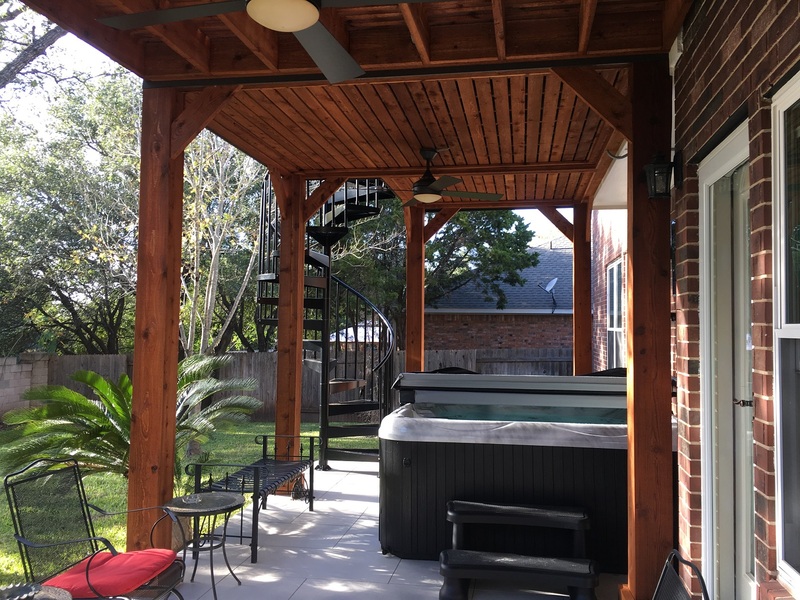 A versatile drop-screen was installed to create a privacy barrier so the hot tub can be used without the worry of prying eyes, and it does deliver an ample amount of shade, along with the pergola, if the homeowner’s choose to use the spa during the day. 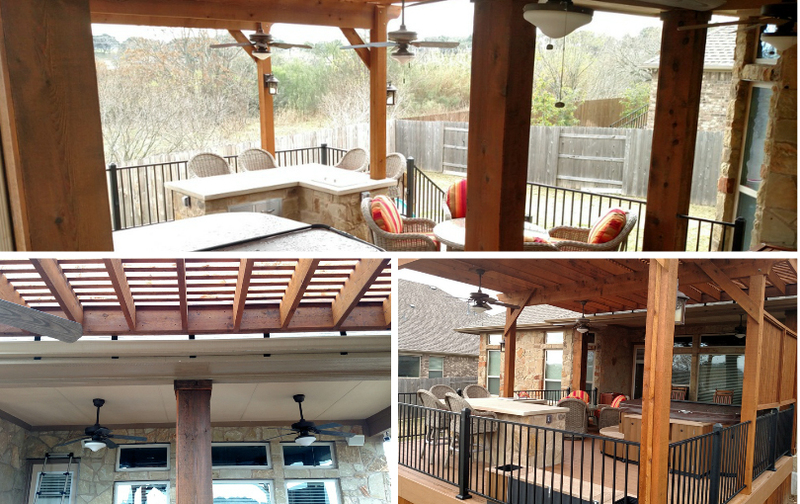 Located just Northeast to the spa area, Archadeck of Austin created an outdoor bar entertaining area within the space. 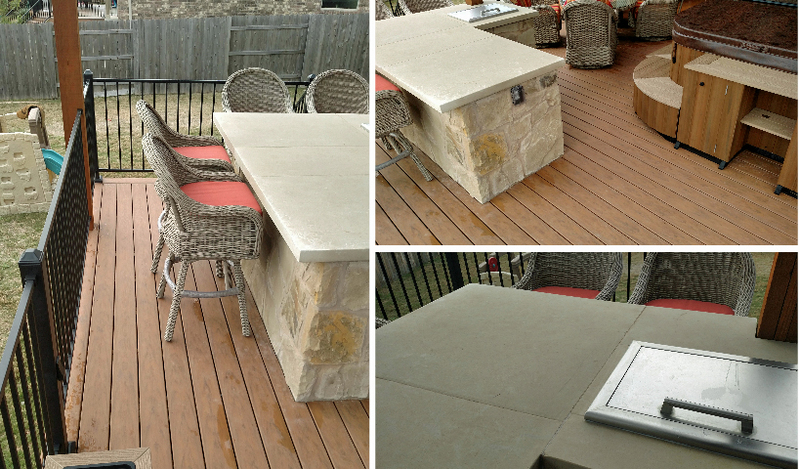 The bar is built using natural stone and features a Leuder’s stone top. 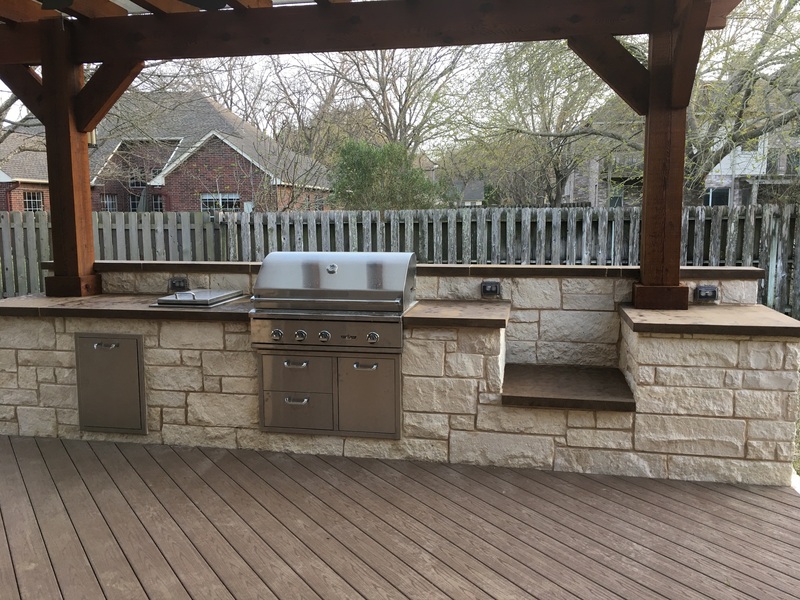 The bar is built much like the bars seen in an interior “eat in kitchen” with ample room for bar stools and even an integrated ice bucket to keep beverages cool on the hottest of days! 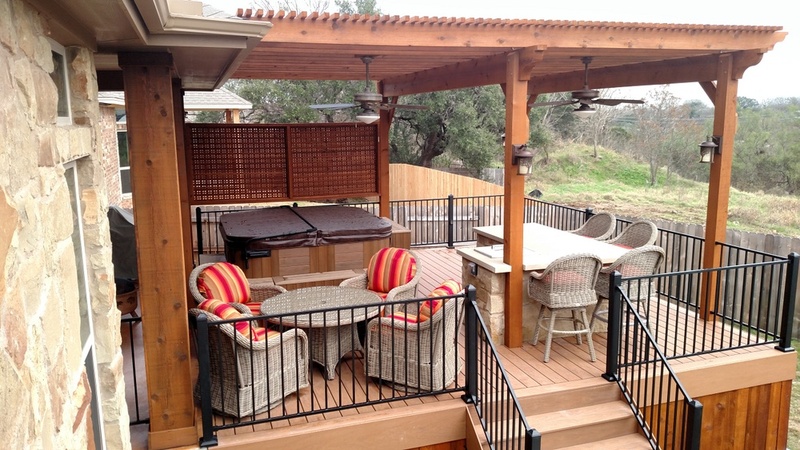 This custom entertainment area also features custom cabinets with plenty of drawers and clever storage. 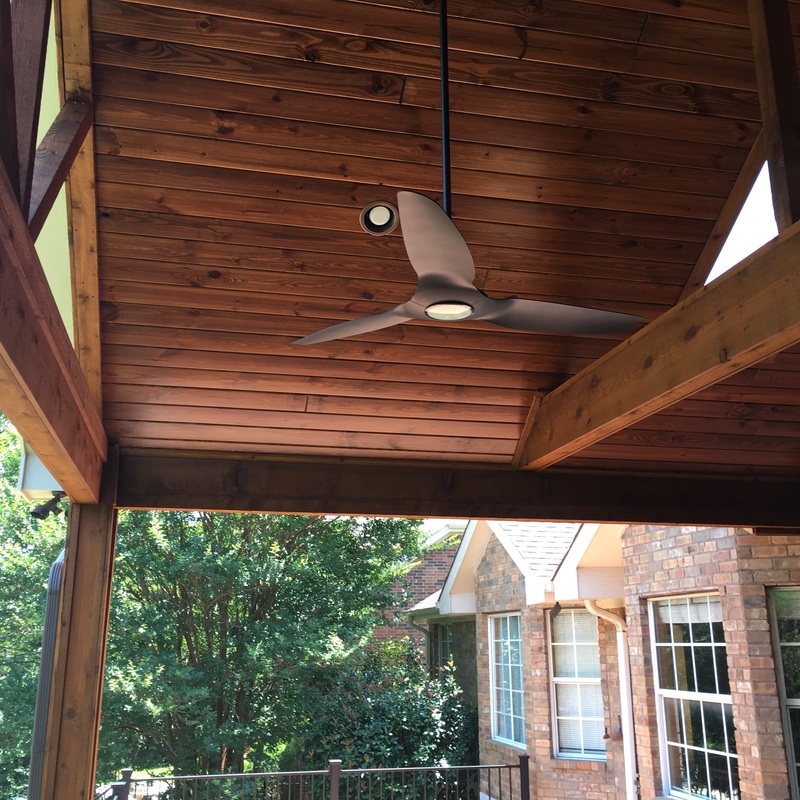 Let us not forget all the creature comforts included within this versatile outdoor living space either; four ceiling fans are mounted to enhance circulation and keep the space comfortable for daily use, while sconce lighting and an LED light package on the face of the posts allows for evening enjoyment! 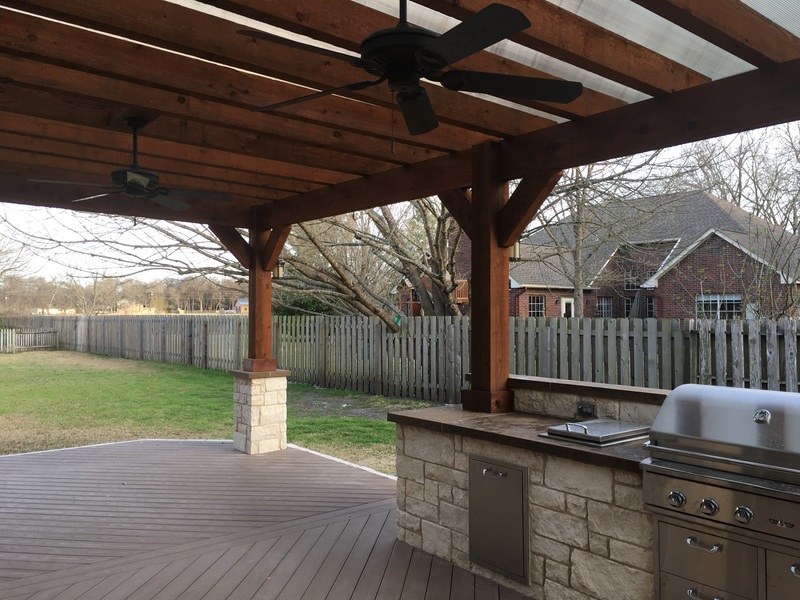 This design literally has everything you could ask for in an outdoor living space, under one pergola! 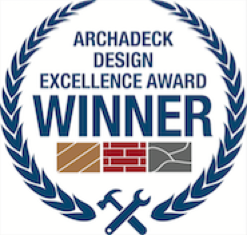 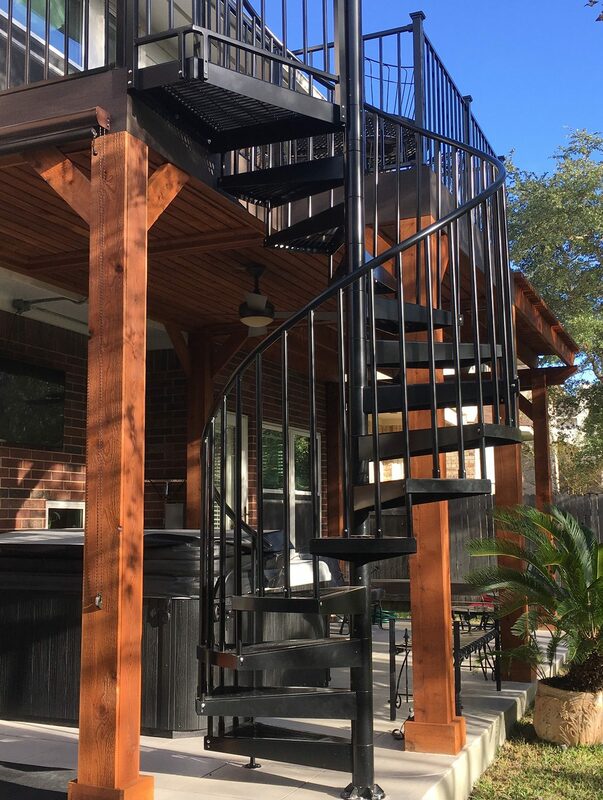 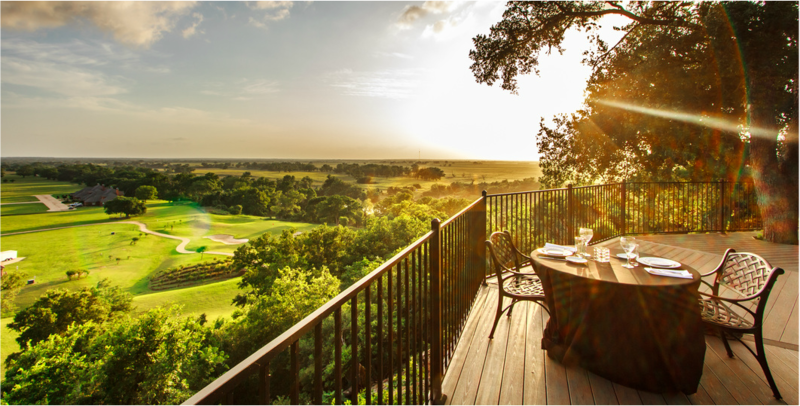 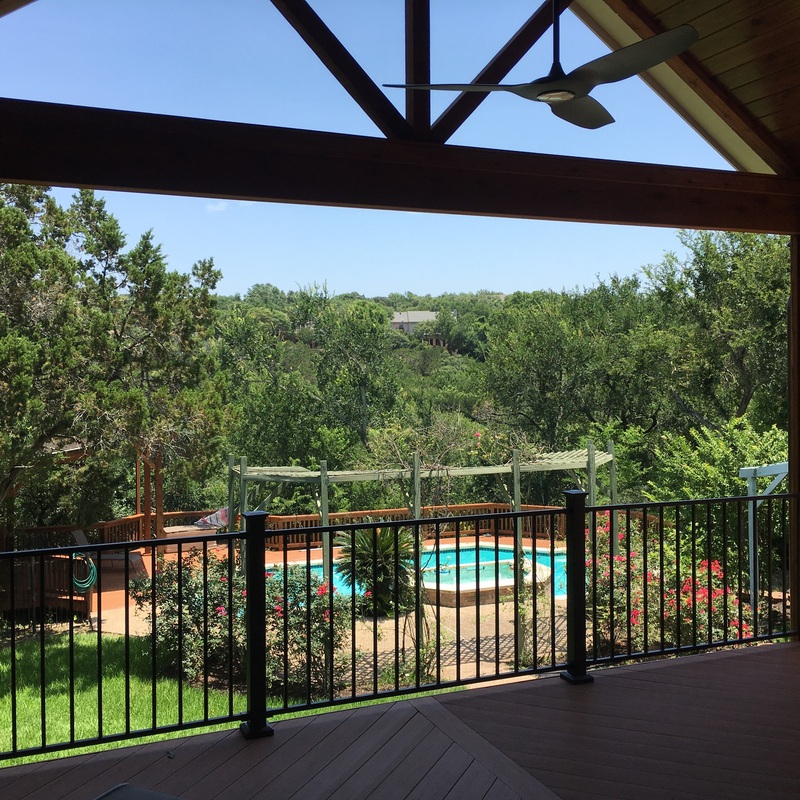 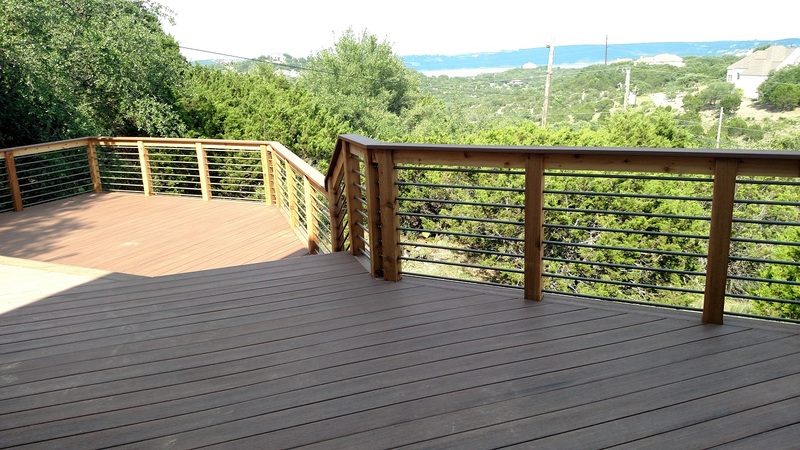 If you would like to learn more about fulfilling your vision of the ultimate outdoor living space, contact Archadeck of Austin.Our talented team of designers and craftsmen can make your backyard dreams a reality! 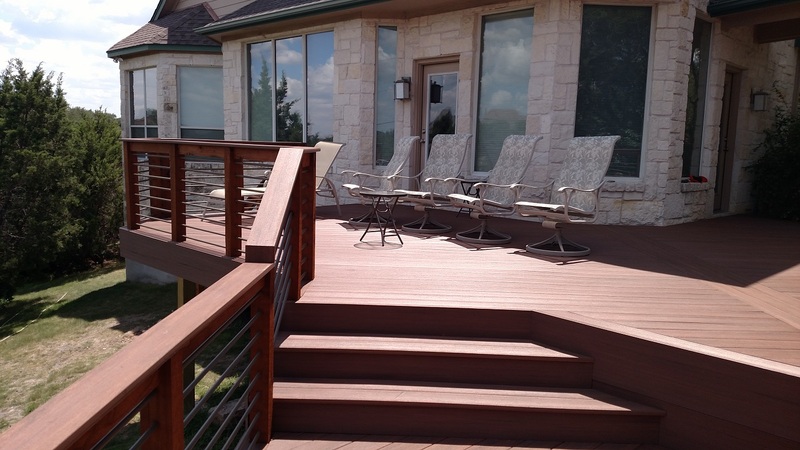 You can reach us at ( 512) 259 – 8282 or email us at jim.odom@archadeck.net.